Twitter Link to external application. Linkedin Link to external application. 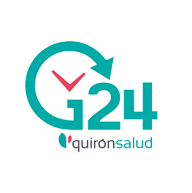 Quironsalud offers the brand new G24 telephone service, providing language support that eliminates language barriers, assists parties with administrative formalities and speeds up service provision. Since the first communication is established, we watch over your needs and create personalized solutions to fulfill your requests. We offer a comprehensive service within Spain through our telephone helpline available 24hrs/7 days a week. A common information point enables us to provide a coordinated response and a speedy service with simplified procedures. As a result, we make administrative procedures related to appointment scheduling and admission easier for you. We are Spain’s first Hospital Group and third in Europe. Our Group has more than 80 hospitals and health centers, all medical specialties, emergency services, etc. You will have your personalized treatment proposal within 72 hours.